If you’re like me, sleep is important. Seriously, who doesn’t like a good night’s rest? Getting a quality sleep makes your life better and gives you the energy needed to continue trekking on with life. Sometimes, though, getting a nice rest is tricky. Whether you’re traveling around, camping out in the forest, or just having some friends over, having the right makeshift bed for them can be a drag. That’s why I eventually turned by interest to an air mattress. They’re fairly quick to blow up, provide lower pressure on your back, and is the perfect companion for long road trips and company needing a place to sleep. After sleeping countless nights on different air mattresses, I finally found my favorite: The SoundAsleep Dream Series Queen Size Air Mattress (view on Amazon.com). 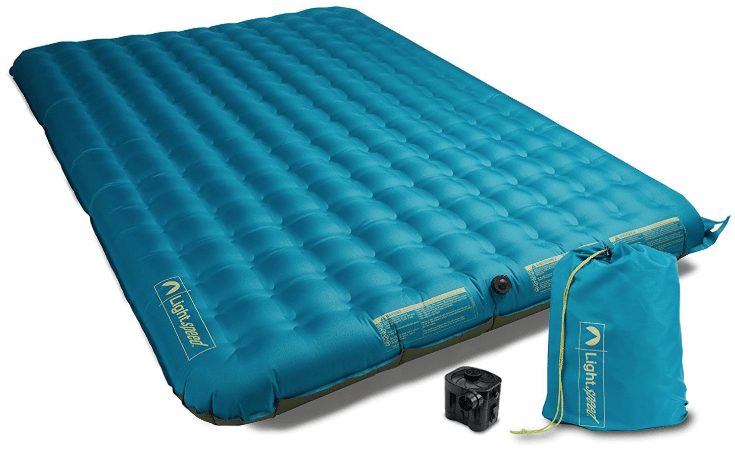 One of the best in almost all the different categories I wanted to see, such as durability, included pump (internal), and waterproof top powered this one to become my go-to air sleeper. Most of my immediate family members went on-record saying they’d happily sleep a few nights on it, if needed, and my wife found it convenient to blow up on-demand. It’s comfy, inexpensive, and easy-to-store, making it perfect for many different occasions. While this Dream Series SoundAsleep may be my favorite, there are 9 more options out there if you want something a little different. Like I mentioned before, this is my favorite blow-up mattress around. 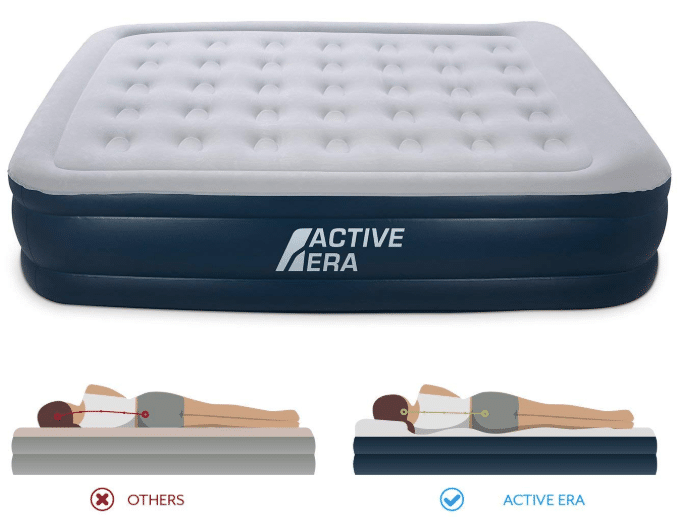 Between the internal, one-click air pump, making it a breeze to setup, and the SureGrip bottom, keeping the mattress in one place, there’s not a ton to dislike here. The whole bed will inflate in 4-minutes, which is decent for a queen-sized bed. Plus, you can make it firmer if you’d like, too. Honestly, you can’t go wrong with the Dream Series queen or twin-sized beds here. There are 40 internal air coils which go a long way to providing great comfort, and the waterproof toper made sure to offer extra durability. I found the bed could last 3-days pumped up before it started losing any plushiness, which was perfect in my book. This mattress is sized at 78” by 58” by 19”, which makes it a good choice if you need to sleep two full-size adults. This probably goes without saying, due to the extra layer waterproofing protection and thick design, but the mattress is slightly heavy. Sure, air mattresses are all going to have some weight, but this one is nearly 20-pounds, which can add a lot of bulk to lighter loads. Also, the warranty could be improved. I know most defects will happen within the first year or so, but with only a one-year limited warranty I didn’t feel completely safe. Another queen-size among my top-ranks, the Lazery Sleep Queen-sized Air Mattress narrowly missed out on my top spot. With this blow-up mattress, I found everything I needed to have a good night’s sleep: fast inflation, rugged design, and a quick-access LED remote to handle any adjustments I wanted to make. The 40-air coils really helped ease the pressure on my body, and the gripped bottom for kept me in one place. It may not be number one, but I found this mattress to be very comfortable, and could stay inflated for 2-days. The electric pump would inflate the whole bed in just under 4-minutes, and the remote control had easy to press buttons. This made it convenient to change the firmness whenever I wanted, while making it easier for guests to control what they wanted. Plus, the durable, strong construction made me rest easy knowing the mattress was waterproof and could support 500-pounds. It’s a tad more expensive than my top-rated choice, which is really the biggest drawback to this queen over the SoundAsleep. While having the remote control sounds good in theory, the reality is it can make things complicated for those that simply want a comfortable sleep. Also, if the remote were to ever break you could find it hard to use the mattress after-the-fact. 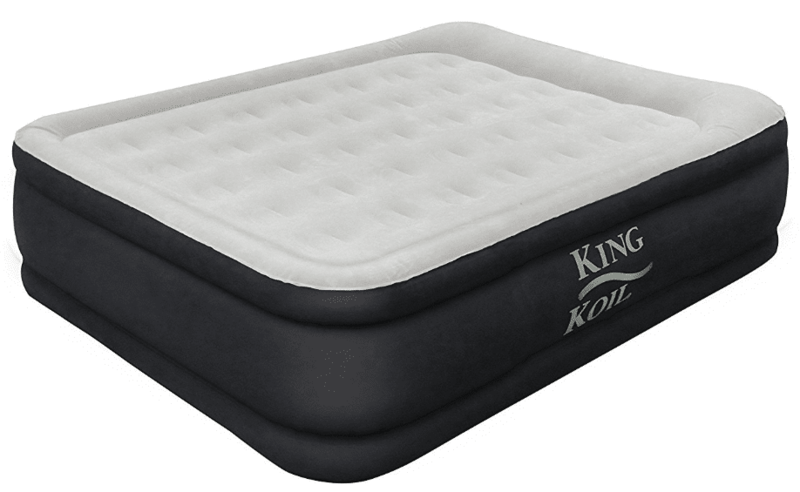 A big name in the air mattress game, King Koil has been around and knows their stuff with blow-up bed designs. This is on full display with their Luxury line of beds. I found this to have one of the softest tops of all the mattresses I tested, which made it a favorite of my friends and family. One of the biggest air beds on my list, the King Koil Luxury Queen measures in at 80” by 60” by 20”, which gave me and my guests a huge area to sleep on. I found it to be on the plushy side by default, but I could change it quickly with the built-in pump. Inflation time was under 4-minutes, which is what I like to see. It’s also light at 17-pounds, making it easier to carry around when needed. Plus, this thing is rated for 600-pounds, which would be enough to sleep three people if you needed, or wanted, too. While the size is rated at 80” by 60” by 20”, I actually found this to be misleading. The mattress was 20” high, which I liked, but only measured 74” long. That 6” may not be a big deal for some, especially me since I’m a smaller male, but if you’re over 6’ tall you’ll probably find the size a bit lacking. That said, I’ve found reports that there are models that adhere to the posted specs. So overall quality control could be better. 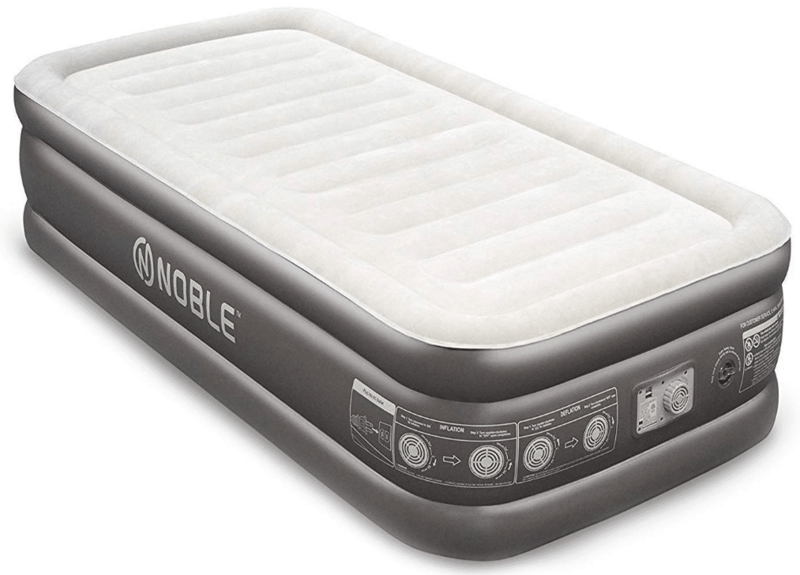 If you don’t need the size of a queen blow-up bed, check out the Noble Twin XL. I love the quilt top on this mattress, and if you prefer a softer place to sleep, this may be a match for you. 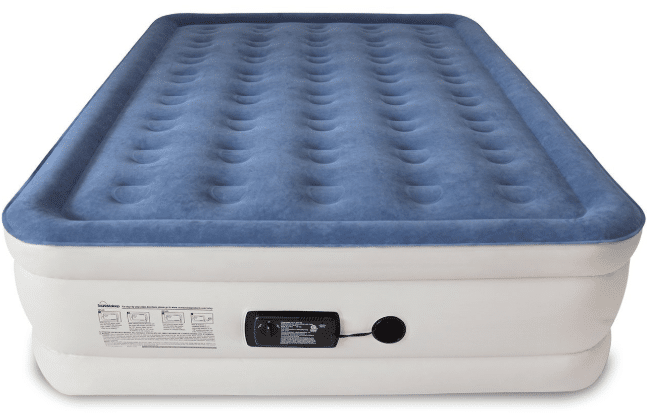 The mattress uses a built-in air pump, for easy inflation, and the thick, waterproof quilt top is one of my favorites on all the air mattresses I’ve tested. I wanted to find a good quality mattress for under $100, and it seems I’ve done that. If you don’t require, or need, a bigger mattress, this extra-large twin should fit you just fine, as it measures in at 80” by 40” by 18”. I found it on-sale for only $85, which, in my opinion, is a steal. Between the suede material and Noble’s coils, I found the comfort here supreme. There’s a one-year warranty should anything come up, too. 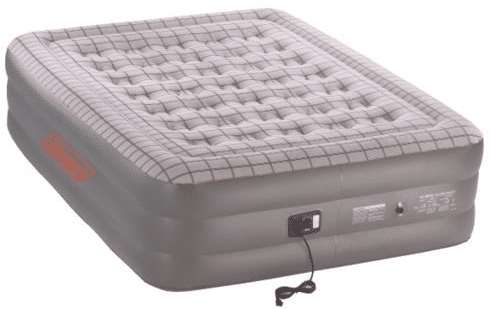 It’s difficult for an air mattress to appeal to all types of people, and that’s the one drawback with this model. Sure, I’ve raved about the pillow-soft comfort it provides, but what if you prefer a firmer sleep setting? While you can over-inflate this mattress, it’s not recommended to do so. Also, another thing to consider is weight. I know it may not be a deal-breaker, but even with the carry bag this still tips the scale at 19-pounds. This is a light weight handheld vacuum that has a long enough cord to plug in without much of a problem. The cord can be easily kept around the handle. The brushes that roll and the powerful suction make the product very effectively. It comes in a nice bright color for those who are specific about the aesthetic aspect of the product. 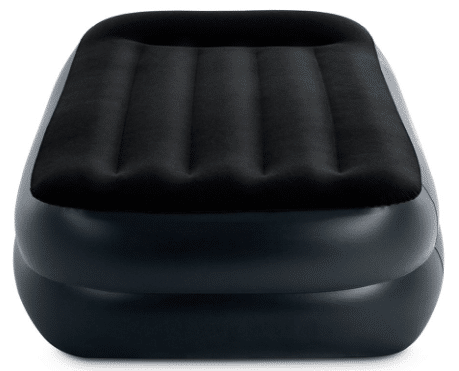 This is the best air mattress on my list if your primary goal is to support the highest-possible weights. The Etekcity boasts support for up to 650-pounds, which is easily three full-sized people. I couldn’t test this, as between me, my wife, and two friends we only weighed 522-pounds, but the bed was ever-stable. You’ll be able to set this up in 4-minutes thanks to the internal pump, and should any issues arise you’ll be covered thanks to Etekcity’s two-year warranty. Looking for the best travel and camping option around? If so, I don’t think you could do much better than this Lightspeed Outdoors blow-up bed. It’s ultralightweight, easily packable, and made from abrasion resistant TPU material, which is more durable than normal PVC. I wish there were more travel-based air mattresses in the world. Seriously, not everything needs to be “luxury” or “pillow-top” quality, as sometimes you just need a quick-and-easy bed for those overnight trips. After doing my own research, I settled on the Lightspeed Outdoors, and I’m glad I tried it out. There’s good value here, and the material really felt strong and rigid. Plus, it was so easy to carry around, even for long periods of time. Since it’s so light, the company had to cut corners somewhere. The biggest areas that I wish were improved come with the pump and overall comfort. While most pumps are 120V powered, this one needs four D-batteries to operate. I know you probably won’t have access to an outlet when camping or traveling outdoors, but it could’ve been nice on occasion. Again, I know this is meant to be as light as possible, but at only 7” off the ground, you may find this to not be super comfortable. AirMattress.com is a company that prides itself on its inflatable beds (as you might deduce from the name), so it’s fitting that one is included on my list. 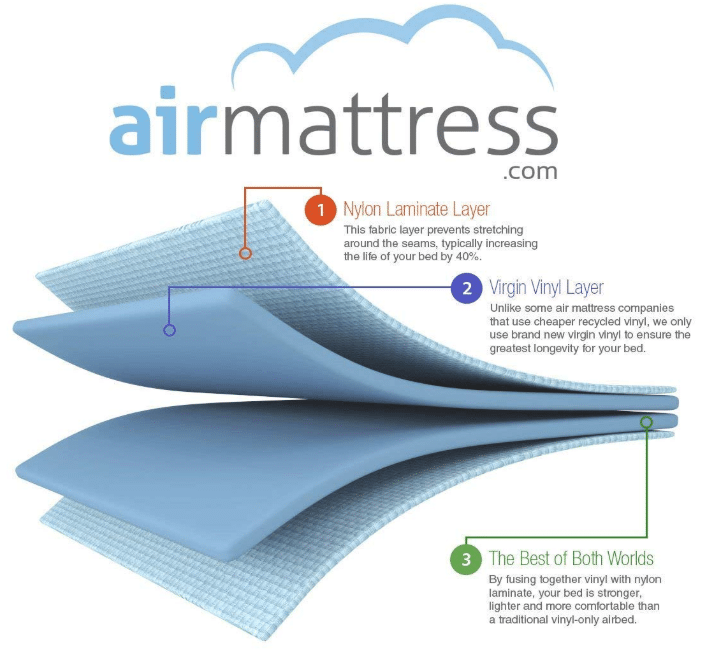 One thing that I realized when looking for the best air mattresses around is there aren’t many king-sized ones to consider. This is probably due to the sheer weight and bulk that would go into them, but still. 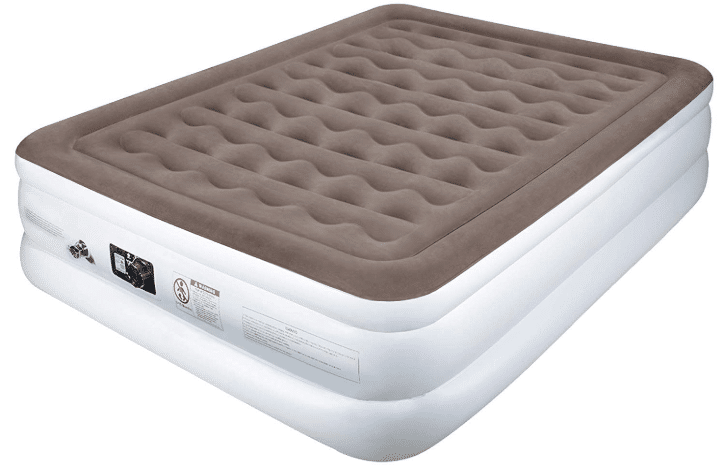 I did, however, finally find my favorite with AirMattress.com’s King version. Need a huge bed for all your friends to sleep on? I did and took a chance on this model. I’m glad I did, as I learned why a lot of folks will size-down, rather than size-up. This bed measures in at 80” by 74” by 18”, allowing you to fit a whole lot of items on top. The laminate vinyl material that coats the mattress is said to be leakproof, and by the build quality I’m inclined to believe it. It’s hard to slim down a king-sized bed, but that would be nice here. This bad-boy came in at a whopping 25-pounds, which is, by far, the heaviest you’ll find listed. You won’t want to haul this around if you can help it. Also, while you may be thinking that since this is heavier and bigger it can support more weight, but that’s not what I found. Overall, this mattress is only rated for 600-pounds of allowance, which is slim for this big of a platform. The fastest queen-sized mattress on my list to inflate, this Active Era Premium blow up bed will serve you will if you want a solid, easy-to-use package. At only 3-minutes of inflation time for the 80” by 60” by 20” mattress, you’ll be in your bed quickly. I know it’s only a minute or so of difference, but that can really make a dent in your comfort, especially at colder temperatures outdoors. There are 35 air-coils for comfort and durability, and the waterproof flocked top will keep everything clean. It was hard for me to dismiss the Active Era and not put it higher on my list, as there isn’t anything it does wrong. In fact, it’s one of the safest options on my list. There’s a built-in pillow, which is always a plus, and I believe this will serve you well for years down the road. The outside fabric uses 15-guage thick material, which is good (lower is better here.) Another reason I would consider this mattress is due to the weight: at 16.6-pounds, you’ll find this easy and convenient to carry around. Because the pump outputs more power than other mattress options, you’ll find it to be louder than others. Also, since the pump uses a lot of energy to inflate the mattress, I think the motor will wear down quicker than other pumps. If you don’t use it a ton this shouldn’t be a factor, but it’s something that swayed me from keeping it longer. Another drawback is weight support, which is only 500-pounds. I think there are better options, value wise, out there, but if you’re in a pinch and need a quick mattress that is comfortable, this SupportRest Elite by Coleman will do the trick. It’s plain in features, and you won’t find crazy gadgets, but it provides a comfortable, good night’s rest, which is what I’m after. While this is a solid air mattress, there are better quality inflatables listed above, especially ones that can be used indoors and outdoors. Still, it’s a bigger mattress at 78” by 60” by 18”, rivaling the king-sized AirMattress.com bed. The antimicrobial top surface was a nice touch, helping combat any odor, mold, or mildew that could end up on the bed after repeated usage. No one wants to sleep on a dirty bed, after all. This mattress, while made by Coleman, whom I know as an outdoor-first company, is only suggested for indoor use, which is kind of a bummer. I’m not a fan of designs on beds, and this air mattress, unfortunately, features some interesting patterns. It probably won’t bother most people, but something to note if you won’t be using sheets all the time. Intex is one of the bigger inflatables manufacturers in the world, and as such you won’t find as good of quality from them, overall. However, that doesn’t mean their products are outright bad. Honestly, their market is decent inflatables for inexpensive prices. The Intex Pillow Rest is just that. It’s short, has a carrying case, and comes with a built-in pump. Essentially, this is a no-frills air mattress. As I said before, you’ve probably heard of Intex. This smaller, 75” by 39” by 16.5”, air mattress is meant to be an easy travel companion. It was the lightest of all blow up beds that I tested, which was nice, but also meant that it was prone to not holding its air. 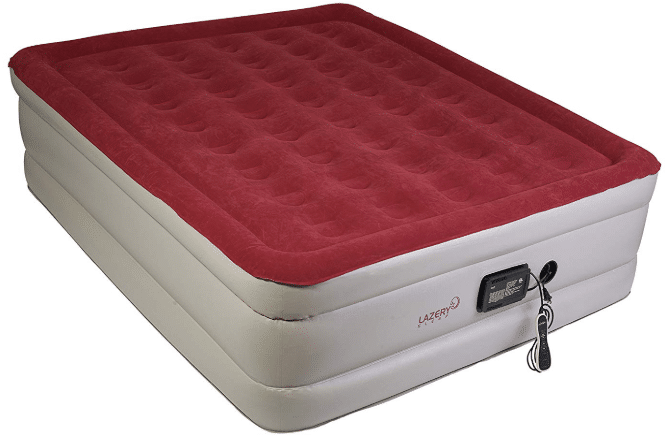 The Intex is rated for 300-pounds, making it pretty good for a twin-sized bed. Honestly, while it doesn’t do too much wrong, nothing makes it special enough. For me, nothing stood out, and while this bed is easily packable for all trips, it also felt “cheaper” than others. This correlates to the many different reviews that experienced a seam splitting after a few weeks of use. That’s the last thing I want to see from any air mattress. So, there are better options available, but this Intex bed can still do the job. While this may be common for you, it wasn’t the first thing on my mind when searching. Think about the primary usage, now and in the future, and adjust your selection to air mattresses that adhere to those uses. If you’re an avid camper now, is that likely to change? Probably not. Do I need to sleep two or three people comfortably every other weekend? If so, your requirements are different than a single person who wants it as a backup. The point is, think about where you’re going to use it. Don’t be like me and go through multiple mattresses! I know it’s easy to settle, but I urge you not to when trying to find the right air mattress for you and anyone else who might use it. I realized that I wanted to provide the best experience to anyone I had over. That meant finding the perfect air mattress for me and others. How did I do it? By ordering and trying out multiple beds, of course. Sometimes it can scary to think about buying something and then returning it, but you want to be happy with your choice. Trust me, your body will thank you later. Even use your air mattress for camping! It was hard, at first, for me to think about getting an air mattress, but I’ll be remised if it hasn’t changed the way I sleep when out of the house. I never thought I’d use one, but honestly not I can’t think of a better item to have on-hand when needed. For a relatively inexpensive investment, you can get a product that should last a while and is comfortable. I can’t tell you the amount of times my friends have thanked me for having a blow-up bed ready for them when they come into town for the weekend. Hopefully this guide has given you the right recommendations for purchasing your own air mattress. For more information and reviews on items to keep around the house make sure to give us a follow!